Have you decked your block? Resurfaced your head? Installed an aftermarket crankshaft or camshafts? 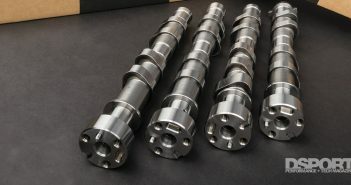 If you answered “yes” to any of those questions, your camshaft timing may not be what the camshaft manufacturer specified. Improper cam timing can lead to reduced performance, increased fuel consumption and an increased likelihood of detonation. 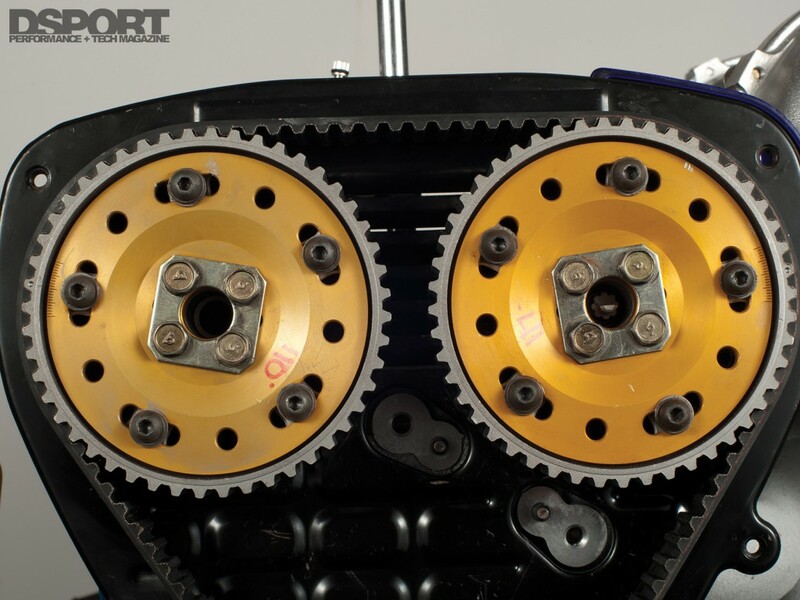 If you have a single overhead camshaft (SOHC) engine, a camshaft that was not degreed-in properly can cause the valve events to happen sooner (advanced) or later (retarded) than originally intended. When all valve events are advanced in respect to crankshaft rotation (piston position), the engine will typical produce some additional horsepower at lower engine speeds. 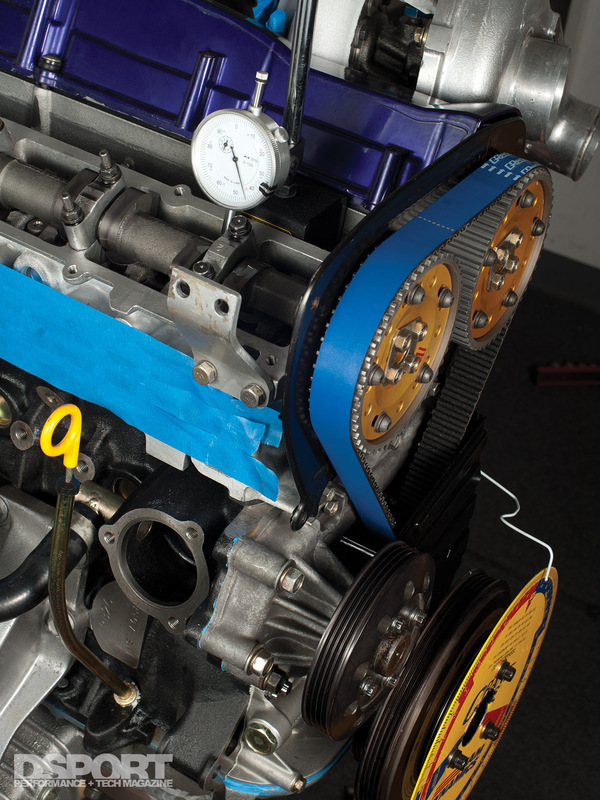 IT’S USUALLY NOT IMPERATIVE TO DEGREE THE CAMSHAFT(S) ON SOHC ENGINES. Unfortunately, the engine may also lose performance at higher engine speeds. 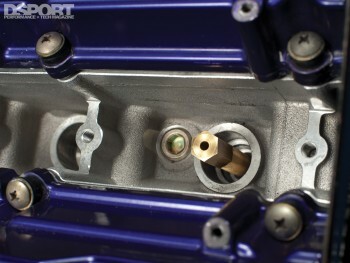 Conversely, when all valve events are retarded with respect to crankshaft rotation, the engine will typically lose horsepower at lower engine speeds. 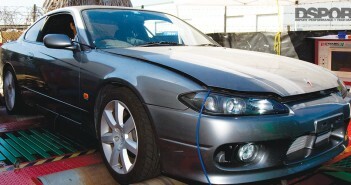 However, the engine may also gain performance at higher engine speeds. While it’s never a bad idea to degree the camshaft(s) in any engine build, it’s usually not imperative to degree the camshaft(s) on SOHC (single over-head camshaft) engines. With SOHC engines, the relationship between the intake and exhaust events is fixed; as both intake and exhaust lobe are ground at a fixed lobe-separation angle on the camshaft itself. Hence, an adjustable cam sprocket will simply advance or retard all of the valve events while keeping the lobe separation angle constant. This means that a tuning session on a chassis dyno will quickly allow the cam timing to be advanced or retarded to the position that provides the optimum power curve. From our experience, the majority of aftermarket SOHC camshafts will generally deliver the best curve between “straight-up” (manufacturer’s recommendation) and slightly advanced. While taking the time to degree the cam on a SOHC engine may be unnecessary if a chassis dyno will be used in the future for tuning the cam sprocket, taking the time to degree the camshafts on DOHC (double over- head camshaft) engines can avoid some serious potential headaches. If there are errors in cam timing on DOHC engines, it’s rare that both the intake and exhaust cam will have the same exact error in the same exact direction (i.e. both intake and exhaust cam are advanced two degrees or retarded four degrees). More often, cam timing errors are different between the intake and exhaust cams. One cam may be advanced more than the other; one cam might be retarded more than the other; or one cam might be advanced while the other retarded. These differences result in a change to the lobe separation angle. The lobe separation angle establishes the relationship between the timing of intake and exhaust events. Why is that important? Lobe separation angle changes (even as small as one degree) could be the reason why an engine can or cannot run at 25psi of boost pressure without encountering detonation. On DOHC engine the lobe-separation angle is simply calculated by adding the intake centerline to the exhaust centerline and then dividing by two. In the case of this RB26DETT, the intake cam had an intake centerline of 110 degrees and an exhaust centerline of 117 degrees. This would equate to a lobe separation angle of 113.5 degrees ((110+117 / 2 = 113.5)). If the intake cam was advanced four degrees to a centerline of 106 degrees and the exhaust camshaft was kept at 117 degrees, the lobe separation angle would be 110.5 degrees ((106 +117 /2 = 110.5)). If the cam timing was set to this smaller/narrower 110.5 degree lobe separation angle, the engine would behave much differently than the 113.5 degree lobe separation angle. With a 110.5 degree lobe separation angle, the engine would generate less vacuum at idle, it would idle rougher, it would likely produce higher peak torque at an earlier engine speed, it would produce less torque after the peak and it would be more prone to detonation. If you are taking the time to build your DOHC engine, get the tools and take the time to degree in your camshafts. 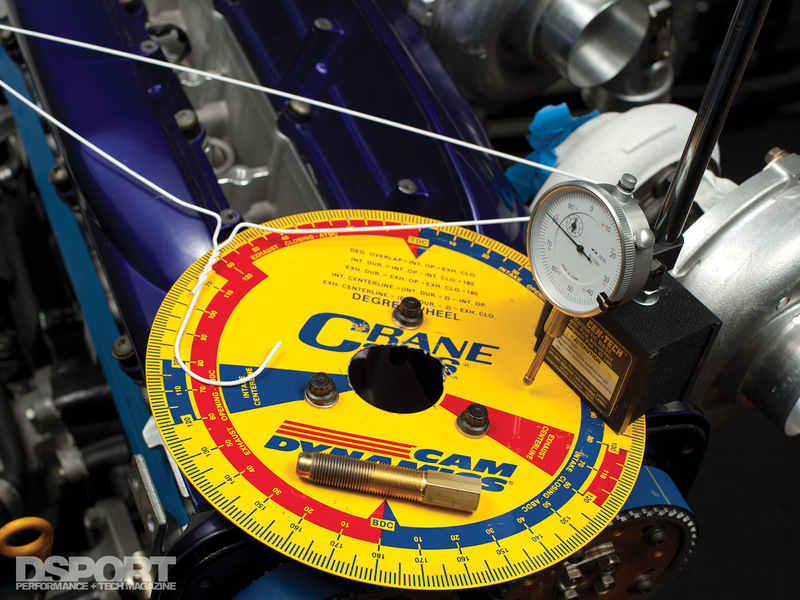 Finding and correcting cam timing issues long before your engine sees its first drop of fuel will likely lead to a longer and happier life for your engine. It’s also likely to keep you from spending hundreds or maybe even thousands of dollars in trying to get your engine to run right. 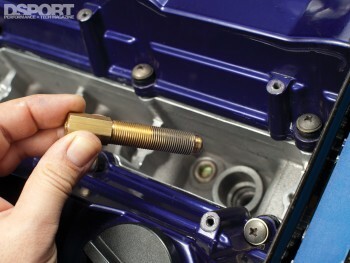 A piston stop can be used to find the actual TDC position for the piston in the cylinder when the head(s) are on the engine. 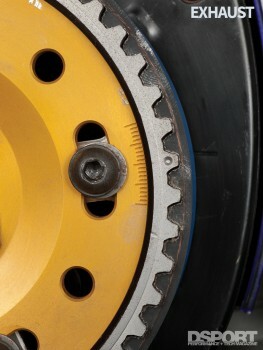 Most engines will have timing marks on both cam sprockets. 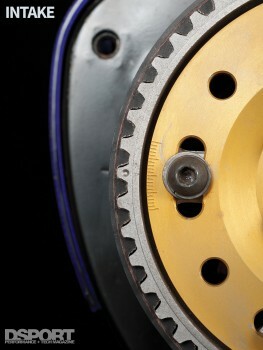 On the RB26DETT engine, the dot on the cam sprocket lines up to a dash mark on the back cover. 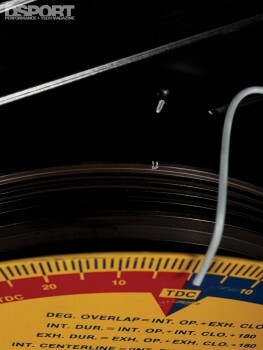 There is also a timing mark for the balancer.